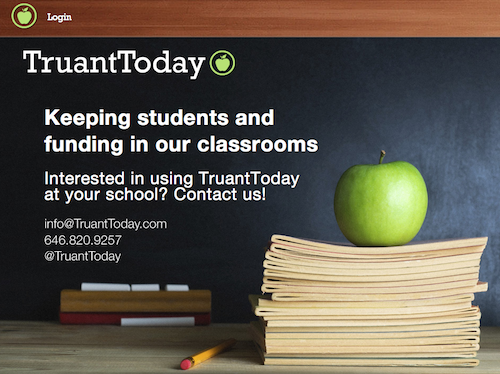 WHAT: Schools can instantly notify parents via text and email messages if students cut class. LAUNCHERS: Zak Kukoff, CEO [ @kukoff, LinkedIn ]. Jonathan Yan, COO. WHY: Schools lose $30 to $50 per student per day in state and federal funding every time a student skips class. INSPIRATION: Says Zak, "TruantToday is based on my experience in high school. Last year, when I was a freshman, I was erroneously marked truant from a class. My parents got a call from the school notifying them two days later, but by that point, I already could have committed a crime." BUSINESS MODEL: Charges schools on a per-student basis but ensures that they are not charged more than the school would get in state and federal funding. Zak says the school gets credit for their next year of service if it pays more than TruantToday brings back. CUSTOMERS: Three committed customers, two in late-stage talks. Not disclosing names. ON STAYING IN HIGH SCHOOL: Zak and Jonathan are committed to running the company full-time. Zak says they can either graduate early or finish online. INVESTORS: Not disclosing until round closes.